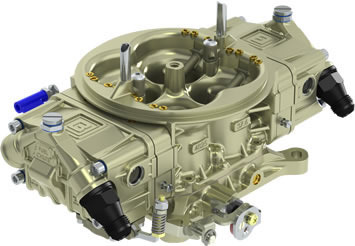 The Braswell B-4760 Severe-Duty carburetors have become the benchmark for racing carburetors throughout the industry. 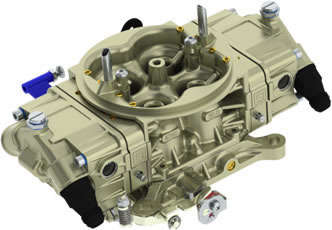 These carburetors are manufactured from a lightweight, high quality aluminum die-casting. They utilize an improved air entrance combined with our CNC profiled venturi to provide maximum air-flow for any given size. This allows the use of a smaller venturi for better throttle response, fuel metering, and atomization. Metering is handled by billet aluminum metering blocks that are fully adjustable. The engine can now safely operate at a lower BSFC, and when properly tuned produce improved on track performance, fuel mileage, and engine life. Our lightweight Bat bowls fitted with Severe-Duty floats that are set up for the specific application are standard. 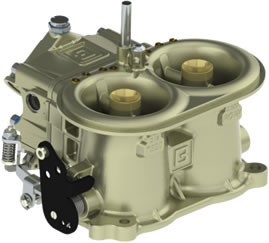 B-4760 carburetors are also available with upgraded Patented Fuel Chute float bowls. The assembled main body is then mounted on to our Severe-Duty dual bolt pattern throttle body assembly equipped with triple ribbon throttle shafts for smooth operation and durability. All components are specifically engineered and calibrated for race applications, not converted street car technology. This means you won't find any unnecessary material or corners cut to utilize existing components. 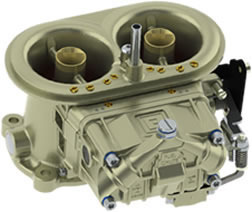 The B-4760 Series carburetors is offered in three Spec sizes, a600 with 1.22" venturi and 1.575" throttle bore, a 650 with 1.25" venturi and 1.688" throttle bore, and a 750 with 1.375" venturi and 1.688" throttle bore, designed for Spec or Crate Motor classes. Braswell can work with sanctioning bodies to provide simple gauges to insure fair competition and simple tech. For open competition classes, these carburetors are available with venturis from 1.25" up through 1.48", and throttle bores in either 1.688" or 1.75" to accommodate the needs of most racing engines. Unlike other carburetor shops or builders that just take something off a shelf, this allows Braswell to custom size and calibrate the carburetor to the specific needs of your type of racing, engine, chassis, fuel, track, and driving style. 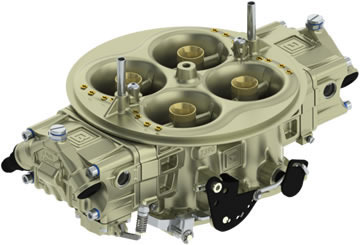 Severe-Duty baseplate with dual bolt pattern, SAE 1-1/2V & 5.38" x 5.38"
The Braswell B-4825 Severe-Duty carburetor has brought racing carburetor technology into the 21st century. This carburetor was designed to fill the needs of both professional and sportsman level racers alike. It is manufactured from a lightweight, high quality aluminum die-casting. The bore centers have been spread out to improve air flow, and fuel distribution. This allows for both larger venturi and throttle bore options while maintaining the proper venturi to throttle bore ratios. This increases fuel atomization which improves both horsepower and drivability. Metering is handled by billet aluminum metering blocks that are fully adjustable and available with either 2 or 4 circuit metering. The engine can now safely operate at a lower BSFC, and when properly tuned produce improved on track performance, fuel mileage, and engine life. Our patented lightweight Fuel Chute bowls fitted with Severe-Duty floats setup for the specific application are standard. The main body is then mounted on our dual bolt pattern Severe-Duty throttle body assembly equipped with triple ribbon throttle shafts for smooth operation and durability. All components are specifically race calibrated/engineered, not converted street car technology, this means you won't find unnecessary material or corners cut to utilize existing components. The B-4825 Series carburetor is offered with venturi sizes from 1.40" up through 1.68", and throttle bores of 1.688", 1.750", or 1.790". 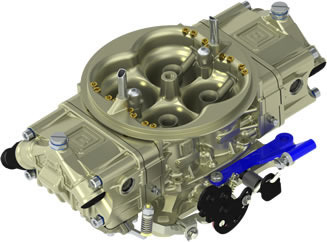 This allows Braswell to size the carburetor accordingly to achieve the best overall power-band for the given combination, Utilizing the new 4 circuit carburetors lets you run a larger carburetor to obtain more top-end power without sacrificing part throttle drivability or torque. Severe-Duty baseplate with dual bolt pattern, SAE 1-1/2V & 5.38"
The Braswell B-7390 was specifically designed as a dual 4 bbl application. Building on the design and record setting performances set forth by the B-7520 2bbl carburetors, the B-7390 has been taking 4 bbl carbureted engine performance to new levels going to the finals in the first NHRA Pro-Stock race where they were legal. These carburetors are designed to be used where a 4 bbl or "Whole" carburetor is mandated by rules or preferred for packaging reasons. Their design allows them to be machined in a wide range of sizes necessary for today's competition engines. These carburetors offer the ultimate in performance for Pro-Stock, Competition Eliminator, Top-Sportsman, Top-Dragster, Quick-8, and Outlaw racing. 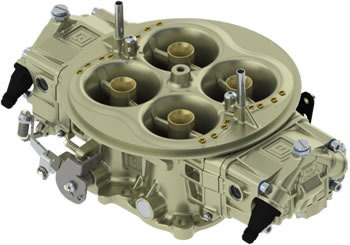 CNC machined from high quality aluminum die-castings, the B-7390's are offered in a wide range of sizes to accommodate engines from 900-2200 plus horsepower for dual 4 bbl use. They feature spread throttle bores for better fuel distribution, longer venturis for smoother fuel metering and an innovative metering system. The fuel jets and their pickups are located so they remain in liquid fuel even when acceleration rates exceed 3.5 G's. The light weight billet metering blocks feature a lengthened main metering well and multiple bleed system provide for improved metering and tuning flexibility unavailable in the past. The carburetor mounting flange can be used with either the industry standard 5.38" x 5.38" hole mounting pattern or the optimized 5.50" x 5.50" hole mounting pattern. The scoop tray flange has been enlarged to an even 8.00" diameter. Venturi sizes range from 1.90"-2.18", and 2.20"-2.55" throttle bores. there are also two different size booster venturi castings allowing these carburetors to be tailored to the demands of today's racing engines. The Braswell B-7395 was specifically designed for single 4 bbl applications. 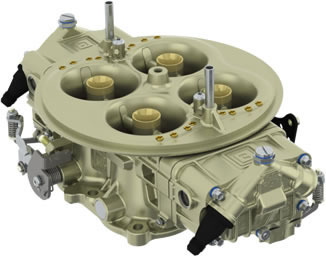 Building on the design and record setting performances set forth by the B-7520 2 bbl carburetors, the B-7395 has been taking the single 4 bbl carbureted engine performance to new levels. These carburetors are designed to be used where a single 4 bbl or "Whole" carburetor is mandated by rules or preferred for packaging reasons. Their design allows them to be machined in a wide range of sizes necessary for today's competition engines. They offer the ultimate in performance for Pulling Trucks, Competition Eliminator, Top-Sportsman, Top-Dragster, Quck-8, and Outlaw racing. CNC machined from high quality aluminum die-castng, the B-7395's are offered in a wide range of sizes to accommodate race engines from 600-1600 plus horsepower for single 4 bbl use. They feature spread throttle bores for better fuel distribution, loner venturis for smoother fuel metering and an innovative metering system. The fuel jets and their pickups are located so they remain in liquid fuel even when acceleration rates exceed 3.5 G's, while allowing the use of power valves for additional tuning if needed. The light weight billet metering blocks feature a lengthened main metering well and multiple bleed systems providing improved metering and tuning flexibility unavailable in the past. The manifold mounting flange can be used with either the industry standard 5.38" x 5.38" hole mounting pattern or the optimized 5.50" x 5.50" hole mounting pattern. The air cleaner flange has been enlarged to an even 8.00" diameter. Venturi sizes range from 1.90"-2.18", and 2.20"-2.55" throttle bores. There are also two different size booster venturi castings allowing these carburetors to be tailored to the demands of today's racing engines. 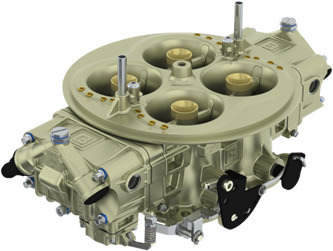 The B-7520 2 bbl has become the standard for multiple carburetion in high horsepower racing engines. It was the first in our 7000 series of carburetors. Designed from start to finish as a racing carburetor, drawing on our over 4 decades of experience in the manufacturing of carburetors for motors sports. 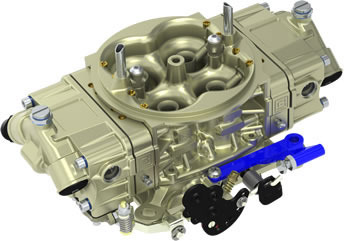 It was introduced to the market in 2007 to fill the demand for multiple carburetor applications using the 2 bbl format. 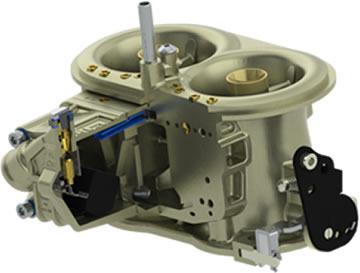 This new carburetor eliminated the former requirement of having to take a 4 bbl carburetor and cut it in half to make a "split". Even when split, the available carburetors which were based on a 40+ year old design have been proven inadequate for today's modern racing engines. The performance of the B-7520 speaks for itself, holding current naturally aspirated and N2O records for the quickest and fastest carbureted runs around the world. Popular with Mountain Motor Pro Stock, Pro-Mod, Competition Eliminator, Top Sportsman, 10.5 Outlaw, and Quick-8 classes. CNC machined from aircraft quality aluminum permanent mold castings, the B-7520 is offered in a wide range of sizes to accommodate race engines from 800-2200 plus horse-power. It features spread throttle bores for better fuel distribution, longer venturis for smoother fuel metering and a totally innovative metering system. The fuel jets and their pickups are located so they remain in liquid fuel even when acceleration rates exceed 3.5 G's The light weight billet metering blocks feature a lengthened main metering well and multiple bleed systems provide improved metering and tuning flexibility unavailable in the past. The manifold mounting flange uses the industry standard 2.75" x 5.38" hole pattern, while the scoop tray uses a 3.75" x 6.71" oval opening. Both of these hole patterns are symmetrical to the C/L of the carburetor. The sizes offered range from 1.90"-2.22" venturis and 2.20"-2.60" throttle bores. Two different size booster venturi castings provide even grater flexibility. Available with either 4 or 5 circuit metering.